The Beresheet Spacecraft captured a selfie in space during its landing attempt April 11. While Israel hoped to become the third nation to successfully complete a moon landing ultimately a series of problems led to a crash landing on April 11 for the unmanned Beresheet spacecraft, Israel’s first lunar orbiter. In a live broadcast online, Prime Minister Benjamin Netanyahu remembered Israel’s history in space exploration and referenced Neil Armstrong’s iconic words in his brief introductory remarks. 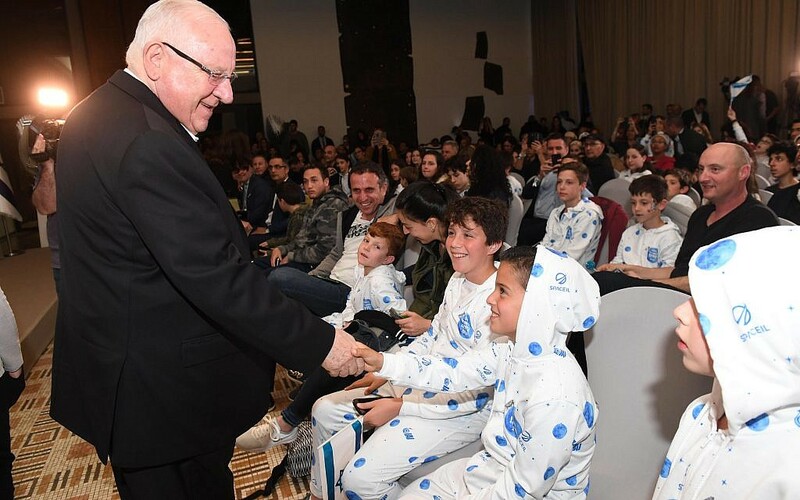 Israeli President Reuven Rivlin hosted dozens of youngsters, ages 9 through 12 with an interest in science, in Beit Hanassi for a watch party. Engineers announced as the landing sequence began, and after the spacecraft passed the point of no return. And while the initial steps seemed to go off without a hitch (even including a selfie from Beresheet), after minutes of descent, the issues began to pile up. Those issues included temporary loss of telemetry and main engines, and ultimately, communications failures in the final entry led to a crash landing as Beresheet attempted its final in a series of complex maneuvers to land in the Sea of Serenity. “We had a failure in the spacecraft; we were unable to land successfully,” a SpaceIL engineer said during the livestream. President Reuven Rivlin hosted students for a watch party. Rivlin shared his thoughts and his disappointment with the children he hosted, but emphasized that this was the first of many steps in Israel’s future in space. “Yes, we are disappointed, but there is no doubt that our achievements and abilities – of our scientists and our country – are wonderful. … Our few resources got ‘Beresheet’ nearly to the moon. When we put our minds to it, we succeed,” he said. After launching Feb. 22, the spacecraft first began its lunar orbit on April 7, following a maneuver in which Beresheet slowed from 5,280 miles per hour to 4,600 by turning around and propelling itself in the opposite direction — the space-travel equivalent of tapping the brakes. Israel remains just the seventh nation to send a spacecraft to orbit the moon. The United States, Russia (then the USSR), Japan, China, India and the European Space Agency have sent probes to the moon, though all landing attempts have failed except those from the U.S. and Russia. Israel’s attempt is also the first time that a privately financed venture has landed —albeit unsuccessfully — on the moon’s surface. The spacecraft, which cost $100 million, was a combined effort between nonprofit SpaceIL and Israel Aerospace Industries and was almost entirely funded by philanthropic donations, according to The Times of Israel. Netanyahu made it clear that this would not be the last the world hears from Israeli lunar landings. “If at first you don’t succeed, try again,” he said.